"I like chili, but I'm not a fan of heat for heat's sake. I wanted something that would warm me up but not be overwhelmingly hot, and this was the result. My husband says that this would also make a good sloppy joe (with beans) mix." Lightly coat the inside of a slow cooker with cooking spray. Heat a large skillet over medium-high heat. Cook and stir ground turkey in the hot skillet until browned and crumbly, 5 to 7 minutes; drain and discard grease. Transfer ground turkey to the slow cooker. Stir crushed tomatoes, black beans, kidney beans, diced tomatoes, tomato paste, chili powder, black pepper, salt, and garlic powder into ground turkey. See how to make a super-simple ground turkey chili in the crock pot. This chili can also be cooked in a pot on the stove top over medium-low heat until cooked through, about 15 minutes. So easy to make. I definitely make this again. We actually put it over pasta. I used the fire roasted tomatoes and that added just the right flavor. Hands down....best chili! super easy and everyone loved it. Very good Chili, I only made a couple changes. I added 1/4 pound sweet sausage to the ground turkey in the browning process and added a can of corn with the beans. I added a sweet onion, yellow pepper and an ear of corn just because I like veggies in my chili. Very little chili powder used, but added smoked paprika. Turned out very good. 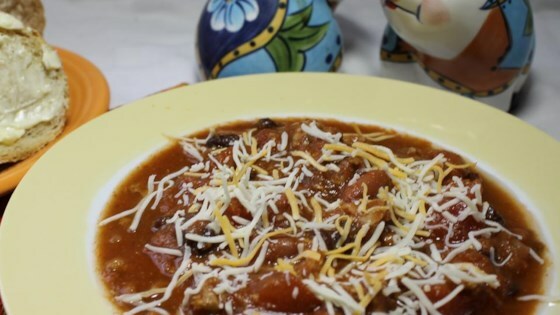 I loved this chili and I will make it again and again!